Last October peripheral maker Power A made a bid for the Android gamepad market with the MOGA, a pocket-sized controller with a flip-up clip for holding your smallish Android gaming device. The idea was that this odd little controller, paired with a smart phone, was effectively its own handheld gaming system, a Google-powered Game Boy. The basic MOGA is a fine little piece of equipment, though at the time I felt it could be a little wider, and the list of games supporting it had to grow much bigger than the initial 40 or so. Seven months later, the compatible game list has grown to 64 — a number I'm positive would be larger if Power A had released the MOGA Pro first. Take a look at the original MOGA. It's a flat, small thing that only nominally resembles today's console game controllers. It functions well enough, but the average gamer wandering through a Toys 'R' Us sees this set up in a kiosk and goes, "huh." Now look at the MOGA Pro. It's an Xbox 360 controller. A strange-looking Xbox 360 controller, but there's no mistaking it. In fact, it shares a bit of design with Power A's Fus1on controller, which I actually prefer over the standard wired Xbox controller for PC gaming. When exploring new territory, like mobile gaming with a controller, it helps to give folks something familiar to ease them into the idea. Nyko understood this with its PlayPad Pro, though a flaky utility app sapped much of the momentum from the product. 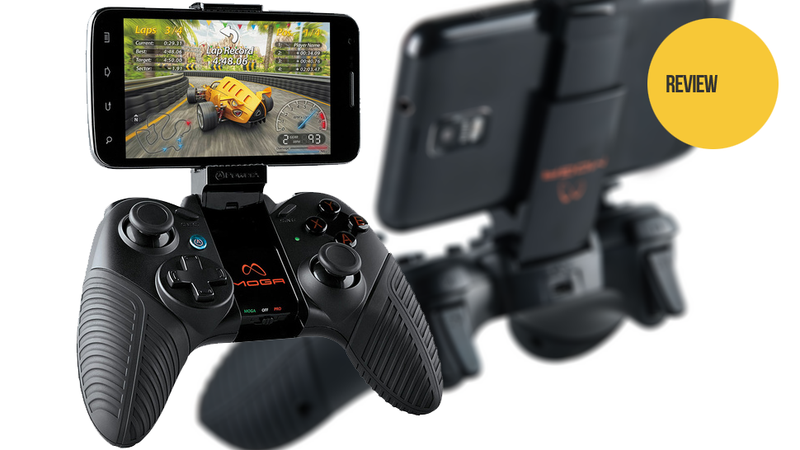 Now we have the MOGA Pro, and it's a fine controller for the Android games it supports. The textured rubberized grips uncomfortable, but they're actually quite pleasing to the hand. The buttons and triggers are responsive, the analog sticks smooth and satisfyingly clicky. With a smart phone mounted in the unit's signature clip, the MOGA Pro is very nicely balanced — I tried it with both my HTC One and my Samsung Galaxy Note II. Used with a bigger Android device (the unit comes packed with a tablet stand) the controller is a bit light — the option to weigh it down for phone-free use would be welcome. I used to think the success of an Android game pad would come down to game support — the more the better. Over the past year I've come to realize that a lot of game developers feel the same way Apple does about controller peripherals — the touch screen is enough — and as long as major players are creating games that rely solely on touch for controls, there isn't going to be an Android controller standard. So check out the MOGA-supported game list, and see if there's anything that strikes your fancy. Then ask yourself if the addition of a traditional controller would make the games you want to play more enjoyable or easier to play. If the answer is yes, and I'm not expecting many of those, then you should consider dropping $50 on a MOGA Pro. It gets its incredibly specialized job done like a champ, and looks good doing it.